An excellent review. And you are quite correct in indicating the popularly of the Endura line. I first became aware of Spyderco in the summer of 1990 when I received an order for Enduras for a USMC squad. Strange looking knife design. However, when you picked one up, aaaah! I restore used knives. Yesterday, it was a stainless steel Seki Endura with a plain edge. Last week it was another Endura with a fully serrated blade. I am sure that this new offering will be very successful. I handled my first Endura last year, and it definitely became clear what people were talking about. It is a fine, fine knife. The Chaparral has that same magical quality – albeit in a much smaller package. A little late to the party here but just saw this review for the first time. Kudos Mr. Schwartz! You covered all the practical points of this small folder, and for someone who was on the fence re buying this knife, you may have just pushed me to do so. Your comment “…there’s a distinct chance that for anybody in the market for a pure EDC knife, the Chaparral FRN is now the sub-$100 entry to beat”. is particullarly apt. 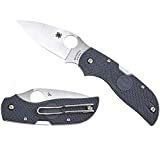 It reminds me of another Spyderco I bought several months ago that fills much the same EDC role…the Urban Sprint in K390. Although a slipjoint and equiped w/a PM tool steel instead of XHP, it’s almost identical in size to the Chaparral and a superb slicer as well, it may actually rival it in the sub-$100 entry to beat catagory since it can still be found for under $70.